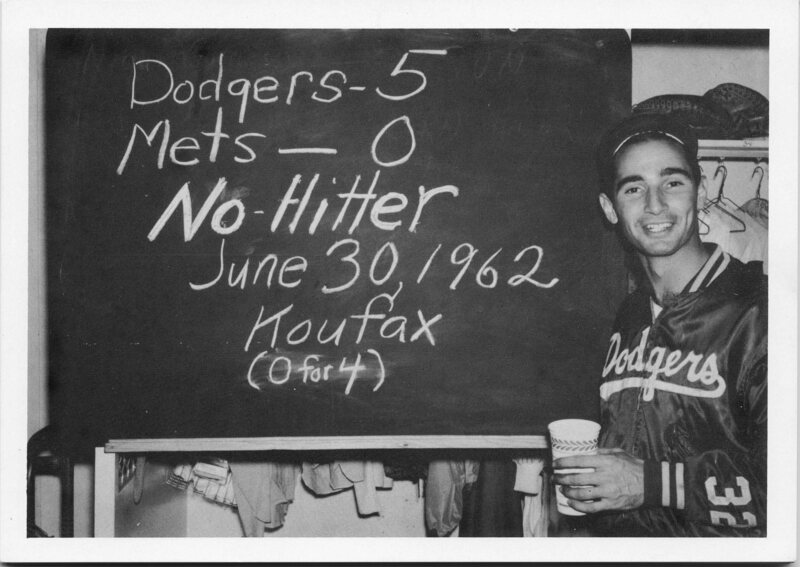 With the approaching 50th anniversary of Sandy Koufax’s first career no-hitter against the New York Mets on June 30, 1962 at Dodger Stadium, I thought it might be interesting to check out the radio broadcast from that evening. Those who didn’t actually watch Koufax pitch in person hear the stories about the “wild” left-hander whose bonus contract with Brooklyn after the 1954 season meant he couldn’t start his career in the minor leagues. After flashes of brilliance, Koufax found his control in 1961 with spring-training advice from catcher Norm Sherry and eventually became the most dominant pitcher of his era. Koufax pitched no-hitters in 1962, 1963 and 1964. His fourth career no-hitter in 1965 was the perfect game against the Chicago Cubs in which Vin Scully called the KFI Radio studio after the eighth inning and suggested the ninth inning be recorded. But how much buildup did Koufax receive on the radio back in 1962? He entered the June 30 game with a 10-4 record, a 2.48 ERA and a league-leading 170 strikeouts in 141.1 innings. At that point, his strikeout-to-innings ratio (10.83) was the best in Major League history. Earlier in the 1962 season, Koufax recorded his second career 18-strikeout game in a 10-2 victory at Chicago’s Wrigley Field on April 24. In the second inning, Frank Thomas hit a grounder toward left field. But shortstop Maury Wills backhanded the ball and his throw beat Thomas. “That ball was labeled base hit when the ball left the bat …” Nelson said. “Maury actually went back a step on the grass to backhand it.” The other close call occurred in the sixth inning when Richie Ashburn slapped an opposite-field line drive toward left, but Tommy Davis charged the play and caught the ball. Koufax struck out 13 batters in the first eight innings. He walked five, including veteran Gene Woodling leading off the ninth inning. New York hit into three consecutive fielder’s choices in the ninth, the final out Felix Mantilla’s grounder to Wills, who flipped to second baseman Larry Burright to complete the no-hitter. Great post. I remembered this one: http://www.npr.org/templates/story/story.php?storyId=9752592. As I recall, on one Mets trip to LA, Lindsey Nelson announced that an old friend wanted to say hello to New Yorkers, opened the window, and Vin waved to WOR-TV viewers. Wonderful post Mark. I take off to SABR42 tomorrow morning but I’ll be back Sunday in time to make it to the game. Glad the game starts a little later.